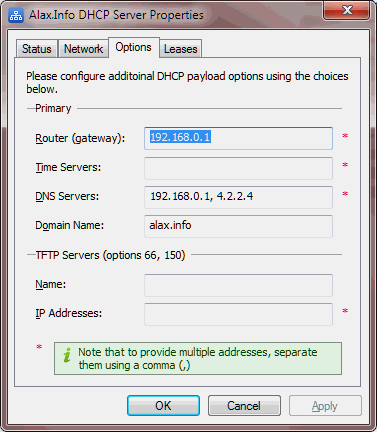 Alax.Info DHCP Server implements a DHCP (Dynamic Host Configuration Protocol) server to assign IP addresses to peer devices on the network. 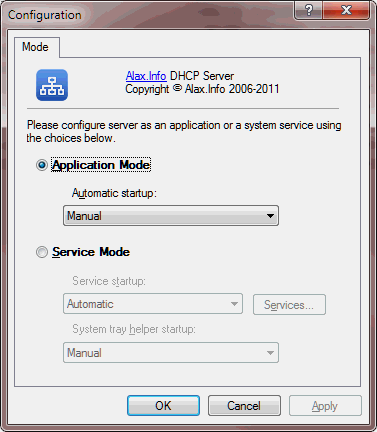 Alax.Info DHCP Server is free for personal non-commercial use and available for 30 days evaluation otherwise. Register commercial licenses online for only EUR 29.95/license (15-day money back guarantee if paid by credit or debit card, see below a note from order processing provider). Software is licensed per server (installation), bulk and unlimited distribution licenses are available on request. DHCP is a standardized protocol that enables clients to be dynamically assigned with various configuration parameters, such as an IP address, subnet mask, default gateway, and other critical network configuration information. DHCP server services are provided with Microsoft server operating systems, however due to availability of various network devices, such as, for example, network IP cameras or virtual machines, DHCP server capabilities are also useful on workstation systems. Alax.Info DHCP Server will run on workstation (2000 Professional, XP Professional, Vista) and server Windows operating systems starting from Windows 2000. Once DHCP Server receives a requires from remote network entity, it allocates an IP address from preselected addresss range and optionally notifies on the action through system tray notification. 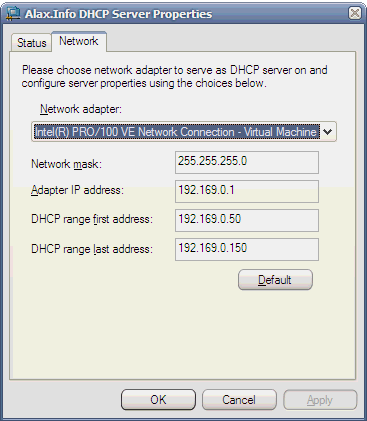 Choose network adapter for the network to implement DHCP server service on and configure IP address range to choose addresses from. Once options are applied, the server is ready to serve remote devices. DHCP Server keeps its lease cache in registry under key HKEY_LOCAL_MACHINE\SOFTWARE\Alax.Info\DhcpServer\Leases which can be edited manually to override IP address assignment. Software is free for personal non-commercial use and provided as a trial version for evaluation during a trial period of 30 days. To continue non-personal or commercial use after evaluation period a commercial license is required. Register commercial licenses online via Share*it! service for only 29.95 EUR/license. Software is licensed per server (installation), bulk and unlimited distribution licenses are available on request. Refunds can only be issued for orders paid by credit card (CCA) or debit card (DBC). Only orders paid in full can be canceled. Only complete orders can be canceled. We cannot issue refunds for shipping costs or cancel orders for individual products from a shopping cart. Dynamic Host Configuration Protocol (DHCP) at Internet Systems Consortium, Inc. Starting version 1.0.5 it is possible to override DHCP Lease Time (option 51). By default it is set to be 1 year, however it is possible to provide a custom value through registry as specified below. Version 1.0.6 fixes a problem when a disabled/invalid network adapter in the system might make application fail to respond to DHCP requests. Version 1.1.1 fixes a problem with running DHCP server as application without elevation of privileges and showing memory/resource lack error. The application is set up to require administrator priviliges and prompts for elevation through UAC (unless UAC is disabled).